I am getting my stuff together for tomorrow morning's 5K race, and it dawned on me that I never did a race report from our big weekend last week. I kept meaning to, but it was a hectic week as our kitchen is in the process of being remodeled, we are trying to get ready for a graduation party next weekend, and I was feeling lousy and ended up being treated for a sinus infection. Craziness! So last weekend was something my husband and I had been looking forward to since last year. 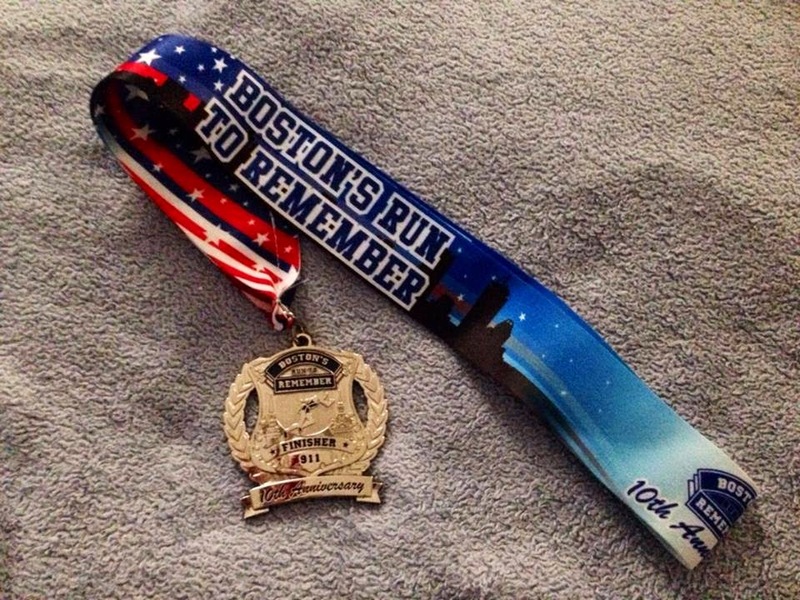 I found out about the 2014 Boston's Run To Remember,which is a race held every year in honor of fallen law enforcement officers, when searching for races on the internet. The proceeds from the run go to a charity and this year monies were being given to youth programs in Boston. There were two events, the half-marathon and the 5 miler. We decided to do the 5-miler because at this point, that would be my second longest distance ever run. Because the event fell the weekend after our anniversary and we live almost two hours away, we decided to reserve a room at the Park Plaza in Boston for the night and go to one of my favorite restaurants, The Barking Crab, for dinner on Saturday, as the race was on Sunday. We left for Boston Saturday morning and stopped at Castle Island in South Boston. It's a neat place. There is a fort and a walking trail (HarborWalk I think it is called), as well as a park. 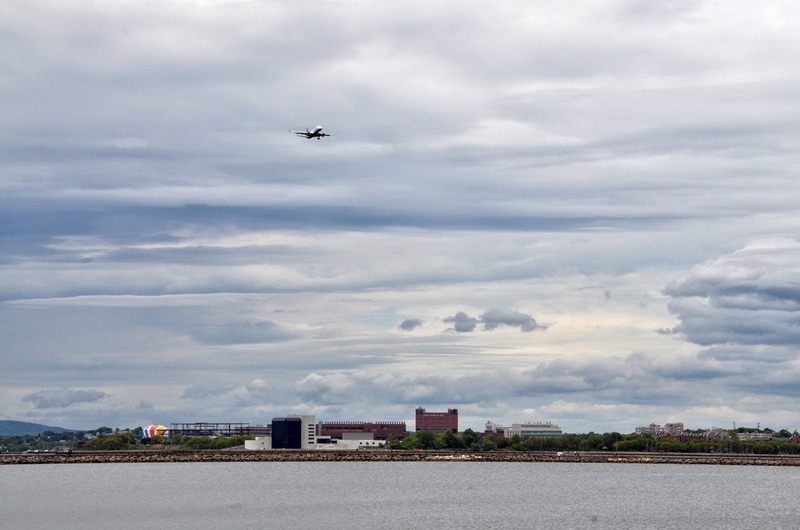 My favorite thing to do there was stand on the edge of the harbor and watch the planes fly in and out of Logan Airport. We checked into our hotel and decided to walk the 1.8 miles to the Seaport World Trade Center which is where the race expo was being held. I am not sure how much I mention this on my blog, but I am obsessively in love with Boston; always have been and always will be. My dream is to someday rent/own a condo in Bay Village and live there for at least a year. That is why we walked to the World Trade Center, instead of taking the subway. It was a beautiful day and the walk brought us through several different neighborhoods in Boston. I had not been to the Seaport district before, despite our many trips to the city and I loved it. Anytime you can stand in a city and smell the ocean, it's all good by me! This was our first running/fitness expo and I was pretty psyched for it. There were a lot of different products and I was excited to see my favorite headband company, Bondi Bands, selling their stuff. We also left there with some new chia energy bars and a pair of running sunglasses that I have been looking for. I enjoyed the different displays they had up listing the names of all the fallen officers in the entire state of Massachusetts, as that was the real reason we were there. We also picked up our bib numbers, race packet, and t-shirts. I have heard other people say that as far as running expos go, it wasn't the best, or the biggest, but I have nothing to compare it to, so it was fun for me. We then made our way next door to the restaurant, Whiskey Priest, and enjoyed a drink on their outside deck, overlooking the harbor. Then we walked back to our hotel. Of course by this point, I realized that my feet hurt from walking about five miles that day, which I said I was NOT going to do and by the time we were ready to leave for dinner at the Barking Crab, I could barely walk. Did I mention that I was supposed to run five miles that next morning?!? So, a cab it was! Dinner was great, as expected, and then back to the hotel we went. The race was scheduled to start at 7am the next morning. Because of increased security measures and screening due to the Boston Marathon bombing last year, we decided to leave the hotel at 5:30am, which meant a wake-up call for me at 4:30am in order to get all my morning medical stuff done and so I could do some trigger release work on my legs before the race. We took a cab to the World Trade Center because the subway's red line did not run that early on Sundays and we thought it best not to walk there. We did get there much too early (5:45am) and we breezed right through security. I think for next year, getting there for 6-6:15am will suffice, as that was right before the crowds started rolling in. This was a big race for us, the biggest crowd we have run with: between 12-13,000 runners for both the half and the 5 miler. It was a younger running crowd in general and a lot of fit looking and thin runners. I mention this because I am still a bit self-conscious about racing as an overweight runner. I definitely do not have a typical runner's body, but lately when I start dwelling on this fact, I just keep reminding myself that I used to be 60 lbs. heavier and because of my illness, could barely leave the house most days, or even the couch. That seems to do the trick! We started at the back of the pack which honestly ticked off my husband a little bit. He wanted to be more in the middle, because he wanted us to fully experience the crowd and he thought it would be a better experience. But I know that I am a slower runner and it is easier for me mentally to be towards the back so that I don't feel pressured by people constantly passing me. One of my biggest race mistakes has been starting off too fast and then struggling to finish. This had to be my way in order for us to succeed. Before the gun went off, the National Anthem was sung and Amazing Grace was played on the bagpipes in tribute to those who have died in the line of duty. It was very touching and also amazing because I have never been anywhere with 12,000+ people who have all of a sudden fallen completely silent. It was a moment I won't forget. We started off on our way and I have to say, it was utterly amazing. You start off on Seaport Blvd. headed towards downtown. I love the Boston skyline and here I was me, Christine Molloy, RUNNING into the Boston skyline!. So surreal. I made sure we started our pace off slow and did my typical run/walk combination. I had stopped using a timer to do run/walk intervals about a month or two ago and instead, started listening to my body. This seems to be working well for me. The course then took us through Post Office Square, Faneuil Hall, Government Center, Charles Street, Beacon Hill, Boston Common and the Public Gardens, Chinatown, Financial District, and then back to Seaport Blvd. That was for the 5 miler. The half marathon runners separated from us at about Mile 2.5 and headed towards Storrow Drive. I thoroughly enjoyed this race course. It helped that the weather was cooler and there was no sun, which for me and my autoimmune stuff, is a really good thing. The course was relatively flat, with about four hills. They were decent hills, but very manageable and most importantly, short! It was the coolest thing for me running through these various neighborhoods, while hearing all the spectators cheering us on. My husband ran with me and to be honest, that did help push me harder when all I wanted to do was collapse. Our goal was to finish the five miles in 1:15:00, so one hour and fifteen minutes. In this race my biggest challenge was not my muscles and joints, but rather my breathing. Allergy season has hit me harder this year than like none before, so that was a bit tough, but persevere we did! This race was also a very well run and organized one, There were a ton of volunteers and plenty of water/Gatorade stops along the route and I was grateful for that. The course was clearly mapped out along the way and there was a ton of encouragement among the runners and spectators. I started to really struggle around Mile 4, but I knew we were going to be turning the corner back onto Seaport Blvd. very shortly. The crowds grew bigger and I was determined to make sure I walked less and ran more. I knew we were definitely not last as there were quite a few runners behind us and I pushed harder because I always like to finish strong. By this point I was doing some running with my hands lifted up and locked behind my head because my husband said that it would help me to expand my lungs more, which it did. The great thing about races is that I have found that people cheer MORE for those towards the back, because they know it is probably harder for them. Thank you to every single spectator that cheered for us. It made such a difference! One of the runners who had already finished was wearing a medal! And then I saw another. I didn't realize that they were giving out finisher medal for this race. My husband and I always joke about how it will take forever for me to earn a finisher medal because in New England, they only seem to give them out for half and full marathons, unless you are a winner. And I knew it was going to take me a while, if ever, to run a half marathon. Oh my God, we were so close to meeting our goal, there was no way we could miss it! So what's a girl to do? Start sprinting of course...all 190 lbs. of me. Sprinting like it was nobody's business and like I was a Kenyan runner. So did we make it?!? Yes! Right before the clock hit 1:15:00. We had started in the back. Which meant that we started approximately five minutes away from the start line and actually had a better time than 1:15:00! Official time: 1:09:48. It was the first race I have ever run a pace under a 14-15 minute mile. Race pace was 13:58 minute mile. I placed 255/274 in my age group and 175 people finished after us. A great improvement from my first race (5K) on Jan. 1st when we came in last. After we crossed the finish line, we walked down the chute towards the water, snacks, and medals. I was bawling like a baby...quite unexpectedly actually. I was trying to make myself stop so all the medics staring at me wouldn't think something was physically wrong, but I just couldn't help it. The only other time I had cried after a race was when I teared up a bit after my very first race Jan. 1st; but nothing like this. I was just so overwhelmed with emotion from the morning. I pulled it together, but of course started again when the volunteer put the medal around my neck. Yes, it was a finisher medal and not an award medal, but I didn't care. I have been training and working so hard on this. The same woman who two years ago, was partially paralyzed from Guillain-Barre, and the same woman who has fought overwhelming physical obstacles to get to this place and this moment in time. That medal signified the overcoming of every ache, pain, and obstacle I have had in the past several years. It was my tangible representation of perseverence and courage. 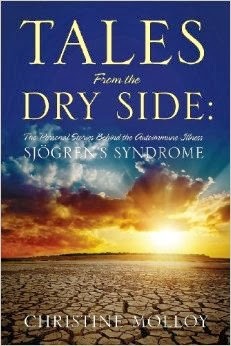 It was my "to hell with you Sjögren's" medal. Now, it will be my constant visual reminder of exactly what I am capable of. Photos Courtesy of: Chuck Myers (click on name to get to photography website).